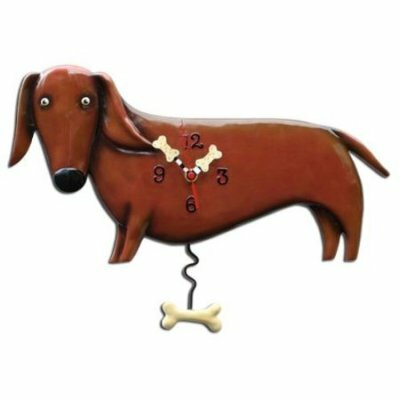 This high-quality Dachshund Pendulum Clock will make an adorable statement in any room! With his wide eyes, perky ears, and oversized nose, this darling dachshund is a fun piece for any dog lover, and is a must-have for aficianados of the endearing wiener dog breed. Dog bone hands and a swinging bone-shaped pendulum completes the whimsical yet tasteful clock. For more details about this cute canine clock, click here.